According to preliminary data released by China’s National Bureau of Statistics, the country’s economy expanded 7.8 percent in 2012 amid the sluggish global economy, reaching RMB51.9 trillion (US$8.45 trillion). The growth rate, although the slowest since 1999, still beats the government’s 7.5 percent growth target. In the fourth quarter of 2012, the country’s economic growth reached 7.9 percent, putting an end to seven consecutive quarters of slowdown, up from 7.4 percent in the third quarter and 7.6 percent in the second. Since the start of the 12th Five-Year Plan period in 2011, China’s economic growth policy has been gradually shifting from a focus on speed of growth to quality of growth. Under this context, the country has set its GDP growth for 2013 at 7.5 percent, which is significantly lower than the 8.4 percent prediction by the Chinese Academy of Sciences. In the first quarter of 2013, China’s economic expansion slowed to 7.7 percent, which sparks wide concerns about the strength of the country’s recovery. However, according to Sheng Laiyun, spokesman of the NBS, the country’s economic fundamentals haven’t changed and the central government is confident about future growth and optimistic about accomplishing this year’s growth target. The total GDP figures of China’s 31 provinces for 2012 added up to RMB57.6 trillion, 10 percent higher than the national figure of RMB51.9 trillion. This is not the first time that the combined local figures are higher than the national figure, and the gap between the two is growing. In 2009, the gap was RMB2.68 trillion, in 2011 it was RMB4.6 trillion, and in 2012 it reached RMB5.76 trillion. Deliberately inflated figures from local officials are largely to blame for such discrepancy, therefore the country is working on a mechanism whereby the central government will handle the calculation of the local GDP. 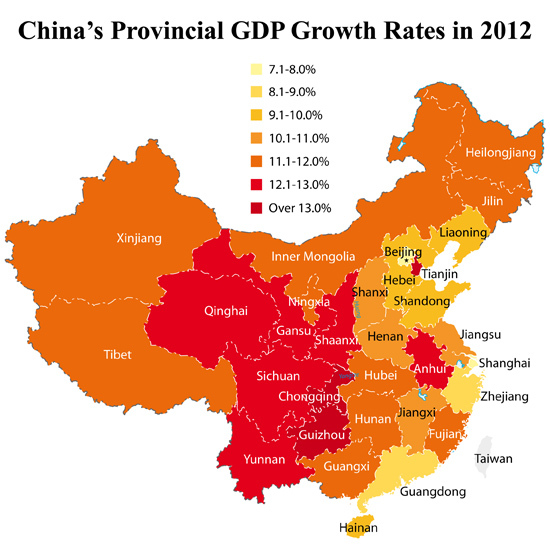 According to these figures, Shanghai witnessed the country’s slowest GDP growth in 2012 at 7.5 percent. However, despite it’s low GDP growth in relation to the rest of the country, the city’s service industry has been expanding rapidly and accounted for 60 percent of its total GDP last year. Following Shanghai, Beijing registered the country’s second slowest GDP growth at 7.7 percent. Although the figure is the municipality’s weakest in the past 13 years, the quality of the city’s GDP growth has improved significantly. Investments in the service sector and consumer spending on recreational activities have become the driving force behind economic growth. Besides, the city’s research and development costs accounted for 5.8 percent of the total GDP in 2012, the highest among cities in the mainland China. Guangdong has topped the nation in terms of GDP volume for 24 consecutive years. However, it has becoming increasing difficult for the province to hold on to the top spot. In recent years, Guangdong has been facing fierce competition from other regions along the coast, especially from Jiangsu, whose GDP in 2012 grew to RMB5.4 trillion along with a 10.1 percent growth rate (1.9 percentage points higher than Guangdong). Moreover, the GDP gap between the two regions has been narrowed down quickly in the past five years. In 2008, Guangdong’s GDP was RMB581 billion more than that of Jiangsu, but the gap has been narrowed to just RMB310 billion last year. According to Xing Xiaowei, head of Guangdong’s statistics bureau, Jiangsu will overtake the province in 2015 if Guangdong does not step up its development. Jiangsu already overtook Guangdong in terms of fixed asset investment and the use of foreign funds. 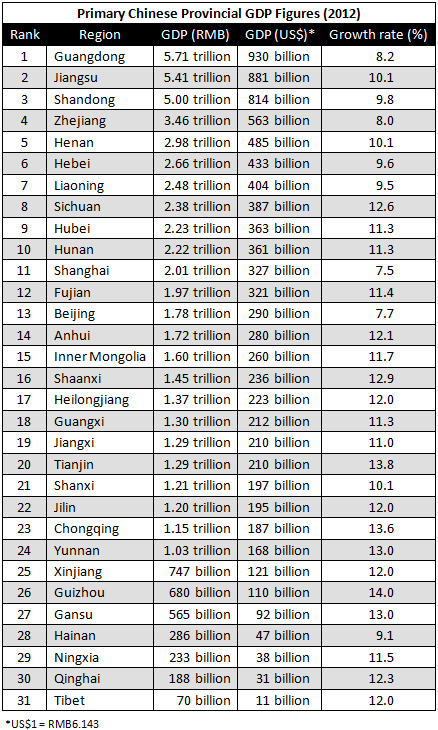 Besides, among China’s Top 500 Enterprises list for 2012, Guangdong takes 37 spots while Jiangsu occupies 51, and in terms of top 500 private enterprises in China, Guangdong has 23, while Jiangsu has 118. In 2012, the GDP per capita in Zhejiang Province, Jiangsu Province and the Inner Mongolia Autonomous Region passed the US$10,000 benchmark for the first time, a threshold for an economy to be considered as “developed.” Meanwhile, the per capita GDP in three municipalities – Beijing, Tianjin and Shanghai – also stayed above US$10,000 last year. The emergence of Zhejiang and Jiangsu can be justified by their fast economic growth and well-developed manufacturing industries, while for Inner Mongolia, the GDP does not reflect the genuine living conditions of the local people, and the region’s relatively low population set against the rising price of resources are the main reasons behind the region’s high per capita GDP. In terms of the per capita disposable income, the region still falls behind the developed provinces in the country. China’s 31 province and cities have all announced their annual GDP growth targets, with 24 targeting GDP growth of 10 percent or above. Given the relatively weak economic growth in 2012 compared to recent years, most provinces have slightly lowered their growth targets. Guizhou Province, one of the least developed regions in China, has set up the nation’s highest growth target at 14 percent, followed by Shaanxi at 12.5 percent. The more developed regions such as Zhejiang, Beijing and Guangdong, have set their development goals at 8 percent while Shanghai targets the lowest GDP growth among the nation at 7.5 percent. This article was first published on China Briefing. For further details or to contact the firm, please email info@dezshira.com or visit www.dezshira.com.